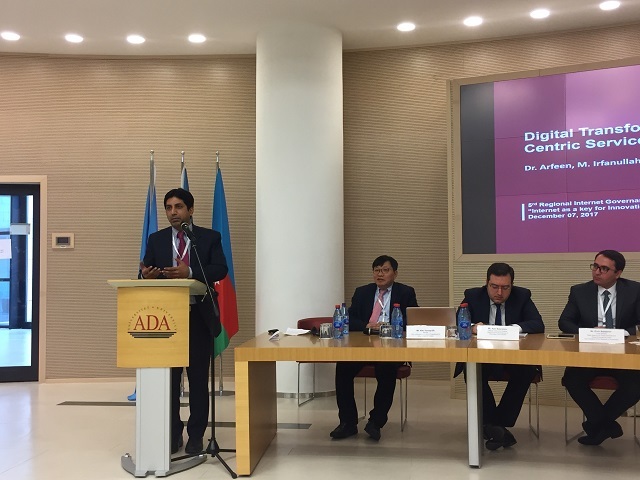 UNU-EGOV took part in the 5th Regional Internet Governance Forum (IGF), which was held on 7 December 2017 in Baku. The main theme was “Internet as the Key to Innovation and Prosperity”. The forum is organized by the United Nations Development Programme and the Ministry of Transport, Communications and High Technologies of Azerbaijan. The event itself was jointly supported by the United Nations Department of Economic and Social Affairs (UNDESA), IGF Geneva Secretariat, and the University of ADA. Irfanullah Arfeen, UNU-EGOV Postdoctoral Fellow, participated as speaker in two panels. In the morning session, Arfeen participated as speaker in Panel 1: Digital Transformation for Innovative Startup-based Economy and Efficient, Citizen-centric Public Sector. The session was focused on identifying responses to major challenges and opportunities to maximize the benefits of the digital transformation supporting economic innovation and citizen-centric public administrations and e-services. In the afternoon session, Arfeen was a speaker in Panel 4: Digital Transformation for Sustainable Development Goals. The panel discussed how to engage key stakeholders – governments, business, citizenry, international organisations, think-tanks – and defined their role in responding to the digital transformation challenges in support of the SDG agenda in the region. Currently, many organizations are working (explicitly or implicitly) toward this target and some may achieve independent and kind of isolated impact. However, there is currently no shared vision or common agenda, a lack of mutually-reinforcing activities that could build trust and encourage communication, and no shared measurement system to track common progress.